This is an incident that occurred on a mountain, which is blessed with beautiful autumn leaves in September, according to the lunar calendar. A noble woman with her retainers came to the mountain in order to enjoy the crimson foliage, concealing themselves behind curtains. The group of Taira no Koremochi, who enjoys deer hunting, happens by the venue of the autumn party. Although Koremochi tries to avoid the place, he joins the women who notice Koremochi’s group and invite them to join the party. The noble woman is ethereally beautiful. 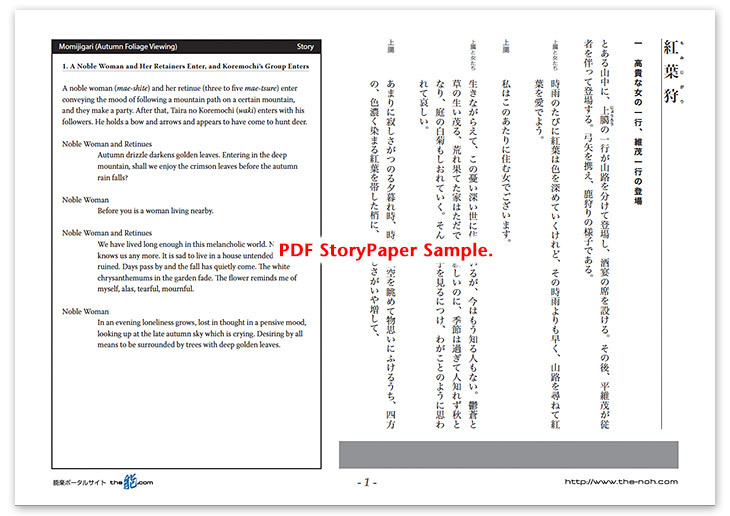 Encouraged to drink, Koremochi cannot help but relax, and he gets drunk and falls asleep. The women keep watch and then and disappear somewhere. At about the time, the Deity Takeuchi, a retainer of the Great Bodhisattva Hachiman, hurries to reach the mountain where Koremochi stays (that is Mount Togakushi in Shinano Province [present Nagano Prefecture]. )The woman who inveigled Koremochi into drinking is the demon of Mount Togakushi. 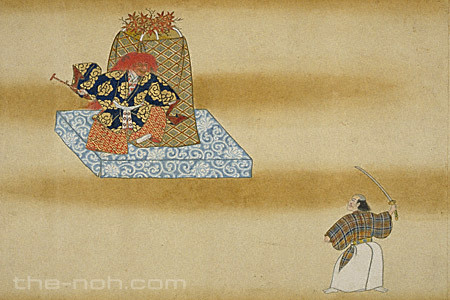 The Deity Takeuchi appears in Koremochi’s dream to explain to him the truth and bestows upon him a divine sword from the Great Bodhisattva Hachiman. The demon appears before Koremochi who wakes up from the dream. Although the demon attacks him, Koremochi bravely fights against it and, after a fierce battle, masterfully slays it with the divine sword. This Noh drama is one of those pieces, which entertain you with unpredictable and spectacular stories, because it gradually reveals the background as the story progresses. First, a noble woman (shite: lead part) appears and announces that they have come to the mountain to enjoy the autumn leaves. At that moment the audience however is neither informed of the mountain’s name nor that it is a trap by the demon. Even the identity of the waki (supporting cast), Taira no Koremochi, famous for his bravery, is revealed for the first time in the midst of the dialogues between waki-tsure (companion of waki) and omo-ai (main interluding cast) in maeba (first half of the drama). Furthermore, with the explanation by the Deity Takeuchi (ai: an interluding cast) during the interlude, the audience learns that the venue is Mount Togakushi and the truth hidden in maeba. Unless ai gives him a sword during this interlude, Koremochi, whose costume is for deer hunting, is not armed well enough and thereby cannot fight against the demon in nochiba (second half of the drama). Scattering “unpredictables” within the development of the story, this drama captivates the audience to two contrasting worldｓ, the gorgeous, glamorous party of the noble women in maeba and the epic fight between Koremochi and the demon in nochiba.